The Government of Premier Abe continues on the path of rearming the Japanese Armed Forces. In fact, this month, the Defense budget was approved, which includes, among other things, 612,35 million dollars for the acquisition of six fighter 5 generation F-35A LIGHTING II, for the fiscal year that goes from 1 April 2019 to 31 March 2020. In addition to the already ordered 42 F-35As, the Japanese National Security Council and Gabinet has authorized the acquisition of additional 105 aircraft. Tokyo has also approved, for the first time, the purchase of 42 aircraft in the B version, namely the short take-off and vertical landing (STOVL), usable on board of naval units. So the total number of fighters will be 105 F-35A and 42 F-35B, making Japan the biggest customer of the Lockeed Martin aircraft. 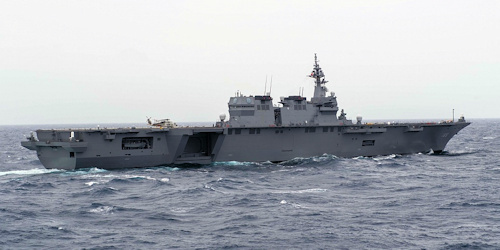 Precisely for this reason the helicopter carrier IZUMO (photo) is being transformed into a pure aircraft carrier, capable, perhaps with the addition of catapults, of projecting power outside the national borders. A cruise missile, with a range of 900 km, capable of being aired by the F-35 is also planned. This type of weapon would be used to hit paying targets, such as large naval units but also air bases and other military installations. It is clear that Japan is deeply concerned by the growing aggressiveness in the Pacific of China. In this regard, Beijing's territorial claims against archipelagos continue, such as the Senkaku islands, which are of great strategic importance for the control of trade routes. The problems do not come only from China, in fact North Korea, despite having recently softened the tone, continues to be a country to keep under control, due to its significant nuclear deterrent. The Italian government, however, continues to express perplexities on the F-35 program, announcing a specific study aimed at verifying its cost / benefit ratio. Despite the political slowdown, the chief of the Red Air Force declared, last November 30, that the Italian F-35A have officially achieved the IOC (Initial Operational Capability). With the attainment of this capacity, our F-35A are able to express, first in Europe, a real operational capability with an 5 ° generation aircraft.